Food and organic products play a major part in our daily life. Nobody could survive without a good source of food, but it has been everything for a very long time. People nowadays can only enjoy themselves with the tasty dishes, healthy recipe, fresh fruits and meat. To satisfy everybody in this line of business, a strong online presence is required. A mediocre website won’t do, or maybe it would cause harm to your reputation as results. How could you have for yourself a nice and professional online store? There’s various way to achieve such feat. You can either hire someone to get what you want or do the job yourself. If you’re no adept in coding then the latter would prove to be tricky while the first will cost a heap sum of money. Worry not for we have a solution for your problem already. You can forget about your technical handicap since you don’t need much to install, use and manage a website using these WooCommerce themes. Woocommerce is an e-commerce platform excellent for those who love WordPress. It is very popular and is the top choice for those who want to start e-commerce with WordPress. The designer also always in favor to Woocommerce in the last time. For an online food stores the the vibrant trendy layout will invite to look in and inspire to make a purchase. The shopping will be pleasant and easy due to wisely arranged products, thought out categorization and easy to follow navigation. These 15 Awesome WooCommerce Themes 2017 will do you and your organic and food store proud. Hesitate no more, this way is cheaper, easier and overall, better. Balloon is a beautiful and minimalist, easy to use and wonderfully tech-savvy, clean and crisp, reliably responsive WordPress multipurpose commercial WooCommerce website theme. It great for making a Food and Organic Farm eCommerce website. It is rich with cool theme features that will give your customers a smooth online shopping experience. This theme comes available with 3 home page layout options and 7 stunning header layouts. It also allows you to choose between horizontal and vertical Mega menu navigation to help your visitors or customers explore your website without difficulty and encourage they to purchase your products. It features a highly-developed Visual Composer drag & drop page builder to help you construct and arrange unlimited website pages without ever having to touch a line of code. It also includes premium revolution slider plugin, this plugin that enables you to create attractive and professional looking sliders for your online store/shop. Balloon theme is fully optimized for SEO and built using clean and valid HTML5 and CSS3 technologies to help you keep up with the newest trends in web design. Try Balloon now! 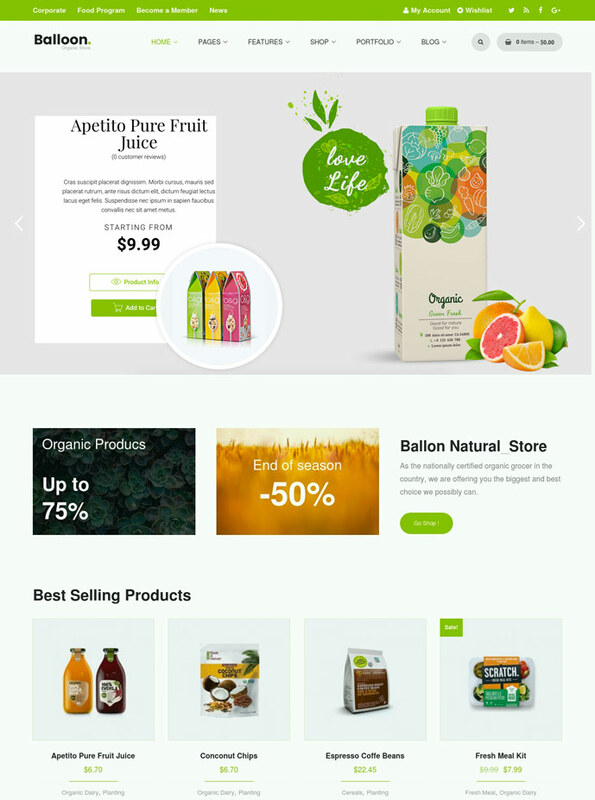 Agrilloc is a beautiful and clean, easy to use and wonderfully tech-savvy, well-documented, cross-browser compatible and SEO friendly, reliably responsive Healthy Food Store WooCommerce WordPress website theme, created for natural food stores. Every element in this powerful package has been keenly optimized for online commerce performance, which is why the sophisticated WooCommerce e-Commerce plugin suite has been integrated at the code level within Agrilloc. Let your customers collate and lay aside these green products with Wishlist & Compare plugin. Product badges and product carousel provide for an impressive showcase of your organic web shop. Built around the powerful WordPress Live Customizer and featuring the industry standard Visual Composer, Agrilloc is an incredibly malleable platform that can be virtually shaped and customized to match your every expectation flawlessly, all the while retaining powerful mobile compatibility owing to its Bootstrap based coding. Product badges and product carousel provide for an impressive showcase of your organic web shop. Star rating, crossed prices and related products will be very catchy for your clients and will boost your sales. TM Banner grid widget allows you to create all kinds of banners for your organic theme website. Your environmental friendly website will have a special look with multiple blog layouts and versatile styles of header and footer. Lastly, Agrilloc theme is fully optimized for SEO with the latest web technologies to help your website rank well on major search engines on the web. Fresh is a modern and clean WooCommerce WordPress Theme. It is designed around the needs of the competitive business market, with features that can maximize your chances of success. 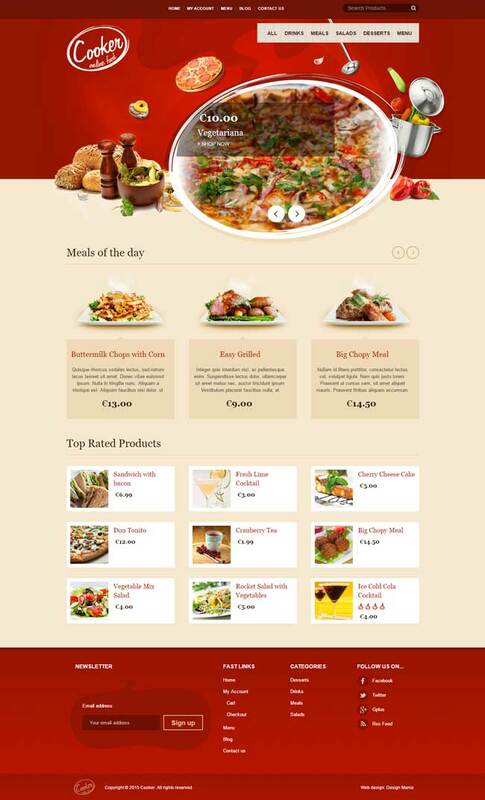 Fresh is especially suitable for Food and Restaurant market website. Fresh theme has been developed with a modular and readily developable Bootstrap framework, augmented by W3C valid HTML5 code and smooth CSS3 animations, and its enhanced King Composer visual page builder, premium Revolution Slider plugins, and integrated WooCommerce support out of the box, on top of a seamless, quick and effortless visual customization process that lets you thoroughly brand your website within minutes, without writing a line of code. Fresh allows you to sell your wares to the world at large within minutes of initial setup. Ample and strong SEO enhancements have been implemented from the codebase up within Fresh theme, ensuring you get the traffic you need to kick off your online commerce website. 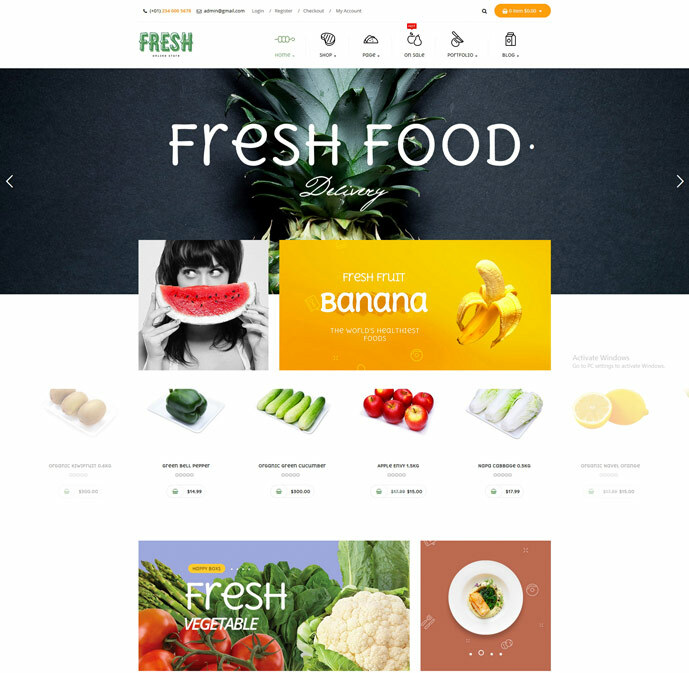 Fruit is a modern and clean, visually smooth and streamlined, graphically polished and attractive, safe and secure, aesthetically appealing and enticing, robust and reliable, technologically cutting edge and mobile friendly, highly intuitive and neatly structured Responsive WooCommerce WordPress website theme. Fruit is a theme for ambitious entrepreneurs who wish to establish themselves in the online space. It is perfect to sell all sorts or organic and eco and farm products like food, fruits, cosmetics, seeds, fruits, coffee and more. 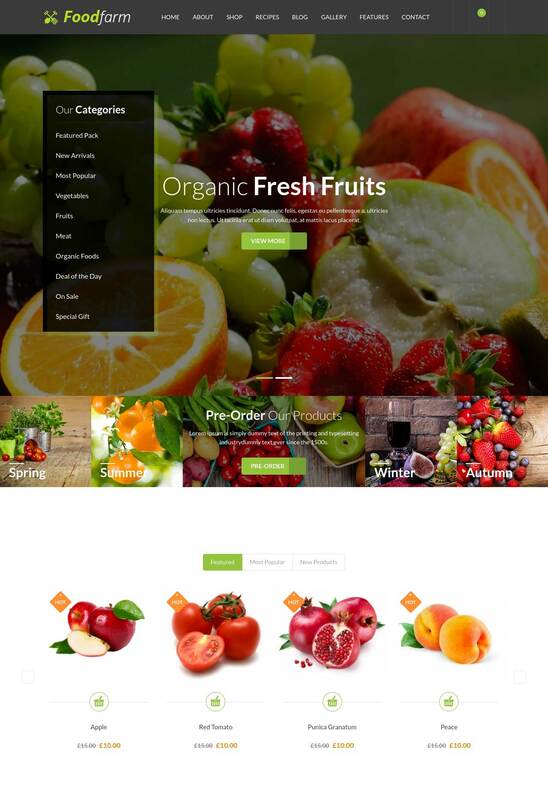 Fruit comes bundled with premium plugins like Slider Revolution and Visual Composer Page Builder that allows you to display your products in your website with ease. It includes pre-built pages layouts that allow you to set up your online shop in an instant. It also includes 2 different mega menu styles, 5 demo home-pages, 40 styles grid post, custom widgets and custom social icons. It is fully responsive and retina ready to function efficiently and look stunningly beautiful on any types of devices. Its intuitive admin panel combined with its powerful built-in page builders makes it easy for you to customize your website without much effort. Potential customers will benefit from a product quick view system, helping them to make an informed decision. Of course, an online AJAX shopping cart function was added. This theme supports WooCommerce plugin, Multilingual Ready (WPML), RTL-Language Support, Search Engine Friendly and optimized for efficiency. The template was designed to fit with the stores that sell tasty natural food. A slider cleverly demonstrate your company slogans and fresh, naturally looking products, adding some interest and dynamics to the layout. 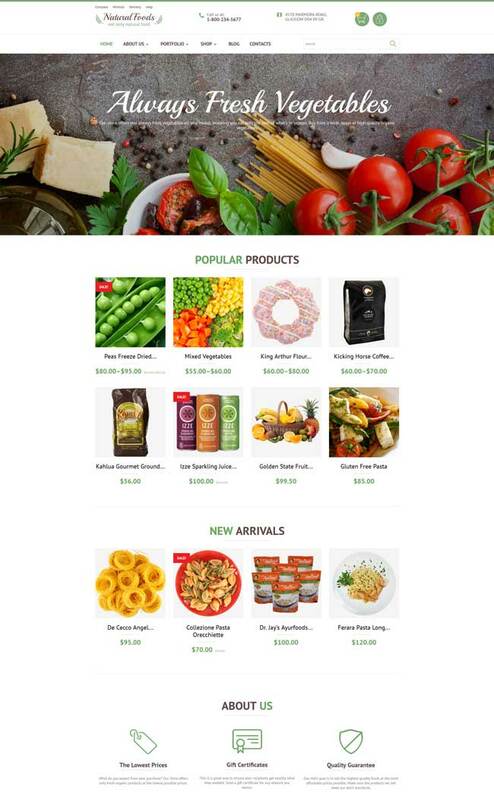 The ‘Popular products’ and ‘New arrivals’ highlight the Product presentation section of Natural Foods WooCommerce Template. Simple, understandable icons easily provide the visitors with useful and easy to understand Information about the store. The slider also feeds your guests with the latest infos about your store products. Newsletter subscription form and Google map are also available on the home page, guiding your customers’ way to the actual store. Organic Web Shop is a WooCommerce Theme that integrates a huge collection of easy to use customization options and features. If you are looking for themes for your store about organic and farm products like food, cosmetics, seeds, fruits, coffee and more, then this is definitely a perfect choice. You will be able to to select from an unlimited number of colors, change the background image, the logo, the favicon, set the number of columns for the footer and the extensive footer. The introduction of an extensive theme option panel makes sure of that. Furthermore, your visitors can also easily link to their social media network profiles, increasing the chance of their spreading the good things about your store across the web. It means more attention, more love, more sales. 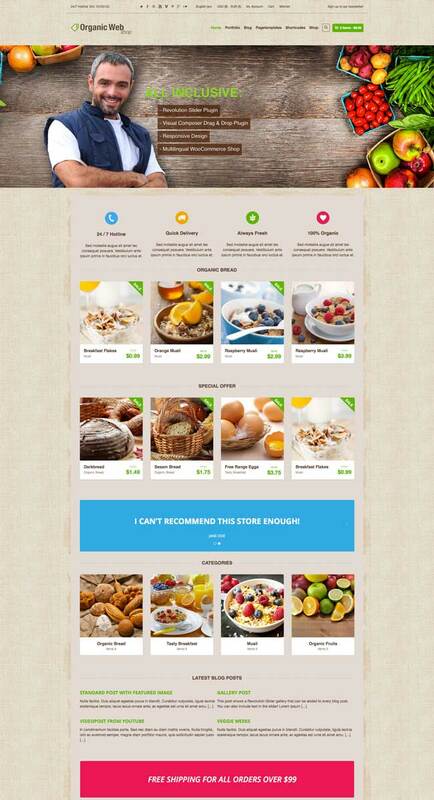 Cream is a premium WooCommerce theme that would improve any food oriented businesses. Any problem with building up a website for ice cream parlours, sweets shops, bakeries, restaurants and other types of food related businesses, you can find the solution in this theme. With a purpose oriented design, responsive layout and special features, you can effortlessly manage products, features, services, portfolio items, testimonials, FAQs, blog posts and pages alike. Its main kits included the things such as Full Localization Support, WPML Plugin Compatibility + RTL Languages Support, Easy and Extensive Theme Options and Many Styling Options. 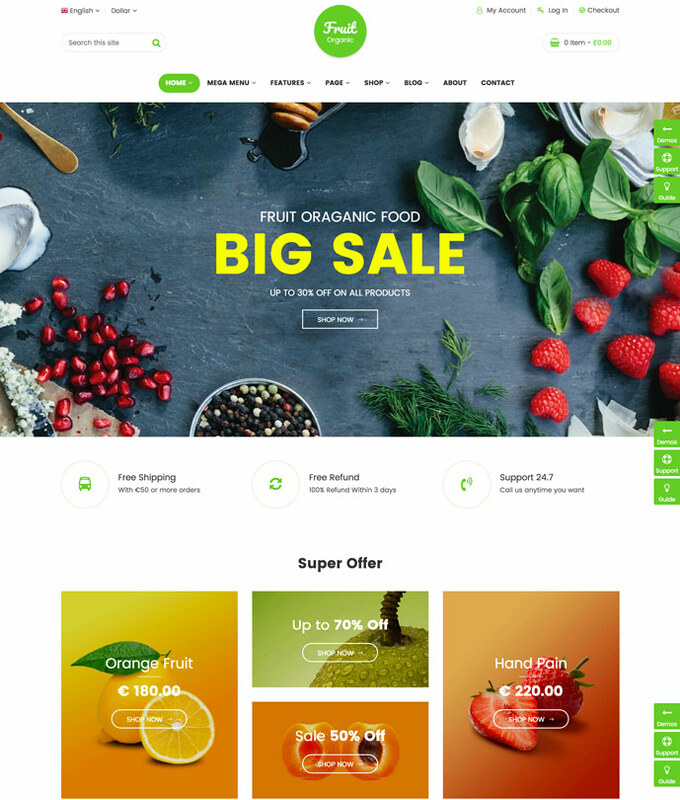 Organic Store is a colorful design perfectly that would be a smart choice for any type of online store that you have in mind, be it agricultural business, agrotourism, healthy food blog or organic food shop, organic farm, bakery – anything can be achieved with this one. Thanks to it being fully responsive and Retina ready, this theme has an and intuitive visual interface and informative layout that looks wonderful on any platform. 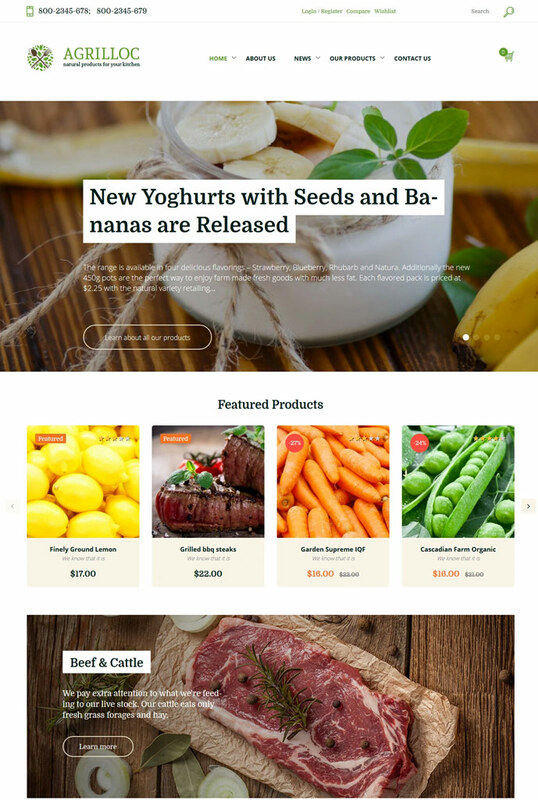 The WooCommerce plugin with full shop design integration is completely compatible with this theme, bringing with it the best tools so building a store of organic produce should not be an issue. You can uplift the conversion of online store simply by setting up a new effective design that will drive people in. Spice Shop modern WooCommerce Theme will assist you in reshaping or starting such a food store. Spice Shop with vibrant trendy layout will invite to look in and inspire to make a purchase. The shopping will be pleasant and easy due to wisely arranged products, thought out categorization and easy to follow navigation. The visitors will be able to do it on any devices because Spice with fully responsive design so can adjustable for various screen resolutions. Try this clean design if you want your food shop to reach new heights online. Prepare to have your shop flocked in by the swarms of children just by deploying this sweet Macaroon Sweet Shop theme for your online store. It’s 100% responsive, fitting any type of device and screen while looking good with Retina ready. The installation of Macaroon Sweet Shop should be quick & easy too since it has an integrated Visual Composer Page Builder. This theme is also WMPL compatible in case you need a multi-lingual site. Besides, you can set up and manage as well as keeping your store up to date without having to know anything about html coding. Your purchase should have everything you need, any even more in the future as the designers are still doing their best improving this lovely theme. WineShop is a beautiful WooCommerce WordPress theme great for built online store to sell wine, food or grocery. You can also use WineShop for organic food shop, winery or farm… WineShop comes with 4 starter home pages layout help installation becomes fast and easy. The theme comes with the most popular of premium wordpress plugins such as Visual Composer, Slider Revolution and Events Calendar so that you have the best exprence using WineShop. Vineyard is a luxury WooCommerce WordPress Theme with clean and clear design style. 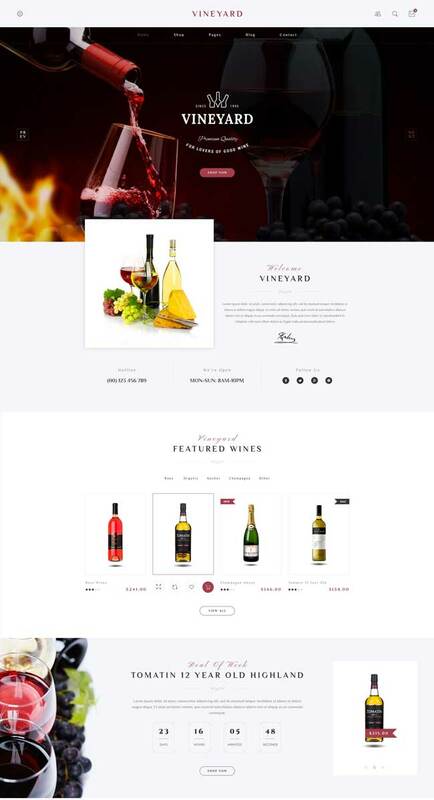 Vineyard WooCommerce theme suitable for wine shop, drink shop, restaurant and other similar kinds of niche. Though the name of the theme suggests that it is about wine and food related site, it is actually a multi-purpose WordPress Theme which you can use to create a fully featured Furniture site and sell home decoration related products. This is a fully responsive and retina ready design which will make your site look great across all modern devices. The theme comes with four different homepage layout options, you can select the one you like and take it ahead with your customizations. It also offers you a variety of different designs for the shop as well as the blog page. It is a WooCommerce ready WordPress theme, so you can easily create your online shop and sell your products to earn handsome revenue. The SEO friendly design of the theme will make sure that your content gets the exposure it needs by helping it get better ranking in the search results. For a measly price of $59, you will get your hand on some of the finest creation of WooCommerce theme for food business-related stores.Cooker is excellent for restaurant, bar, pub or bistro.Everything is so clear and easy to find as this theme is designed in clear code and perfectly organized in sets PSD files. A Blog; online store; to present your restaurant, pub or just to show your cooking skills to the world, this one can fulfill anything you need. And don’t you worry about the difficulty in installation, it has one of the best support you can find on themeforest.com. Yummy Sweets will get the best out of your candy shop with its notable banners, post preview images and a decorative framing of a slider. These sweet interface elements just perfectly set for any confectionary. And a tender palette combining light green and orange shades reinforces such a visual effect. The front page’s brimming with life, enhanced by smooth hover and parallax effects therefore improving customers’ experience. The menu items are equipped with catchy tooltips to inform customers’ about your new products and sales. With a slider, carousel and dropdowns for account options, currency switcher, shopping cart and menu, your site’s front page of your e-store is also kept cleaner. Niku comes with a set of four distinctive predefined homepage template that will help you a lot in deciding your website’s future look. Its designed packed with WooCommerce Element Customizer, YITH WooCommerce Wishlist, YITH WooCommerce Quick View that will greatly improve your website’s performance as well as your customers’ feeling. For a restaurant website, the visitors can also make their reservations quickly with Restaurant Reservations Plugin. It also features Megamenus, Sticky Header and Collapsed Header, SEO Optimized and Social Share button. They’re pretty much everything you need to be success with your website. Coffeera will do you proud with absolute freedom of use through the GPL license. It’s amazing with a great customizability too. You can view all the changes live while making them thanks to integration of an integrated-customizer. The product filters, drop-down cart, advanced search, carousel, and tabs are introduced in an effort to enhance the usability of your store. You can test different choices to find out the most effective one out of a variety of pre-designed layouts as well as header, footer, and sidebar styles. All the formats required for building a fully-fledged resource are surely supported, notably audio, video, gallery, quote, link, etc. Coffeera works equally well on devices of all types, be it a desktop, tablet or smartphone thanks to the Bootstrap framework in its core.